This morning was similar to yesterday, with almost no wind and a few more clouds. We had some time to kill before being picked up to go to the bus terminal for the trip to Punta Arenas so we went for a walk through the heart of the town. That didn't take too long. The bus ride to Punta Arena is about three hours long. On the ride north we only made only one stop to pick up some soldiers at the Punta Arenas Airport and drop them off on the outskirts of Puerto Natales. The ride south was similar to other bus rides I had been on in Chile where the bus stops to pick up passengers. 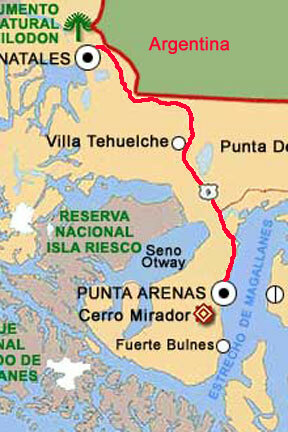 It also made a stop at the airport as well as a number of stops on the streets of Punta Arenas. As we proceeded south, the weather started change for the worse (or normal according to the locals). The clouds grew thicker and showers became more intense and frequent as we approached the Straits of Magellan. 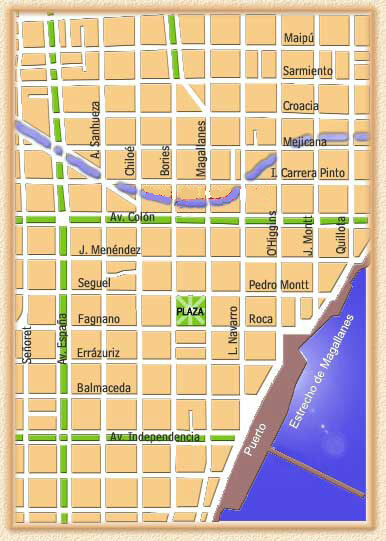 The Cabo de Hornos Hotel is located right on the main square in town and our window overlooks it. The hotel has been here for a while but it has recently been totally renovated. Modern amenities including high speed Internet connection in the room. I took advantage of the connection to upload a few pages that I could not place on the site from Puerto Natales. I learned that my concept of high speed and what exists in this area of Chile are quite different. The upload took two to three times longer than normally expect. Susie had read that one of the biggest complaints of people in Southern Patagonia is that they do not have access to "real" high speed broadband service. The hotel's dining room is quite elegant and it has the identical menu to its sister hotel in Puerto Natales (albeit they prepare the items a bit differently). We got into a conversation with Roberto, the hotel restaurant manager, who told us that he lived in the US for a while and also worked on cruise boats for several years. It appears that he was working on a ship we were on in 1999... A small world with many connections.